Every business owner sabotages their business – often without knowing it. Innovators + Influencers like us are no exception. Why does this happen when surely we “know better”? It happens because we all have personal blind spots that prevent us from running our businesses well. These blind spots cause us to make decisions and take actions that do not move our businesses in the direction we want. They also cause us to not take actions that could be extremely helpful – making our work easier and our workplaces more enjoyable for the entire team. So even though we think we’re doing the “right” thing, our hidden and unexamined blind spots are directing the show….and often not in the right direction. Some entrepreneurs know they have blind spots. What is almost always surprising to most of us is that we share common blind spots based on our Personal Operating System (also known as our “brain type”). We all like to think we are unique, but when we have the same Personal Operating System as someone else, we, in fact, have the same set of blind spots. Our Personal Operating System determines which blind spots we have. As you can tell by the focus of this website, we focus on Innovators + Influencers. First, as innovators + influencers we simply Do Too Much (and too much of the wrong things). We start lots of things, spread ourselves too thin and do too much, leaving us overwhelmed, over-committed, over-worked, undervalued and underpaid. This is a blind spot because even though we may have a vague idea why it is happening, it’s still far enough out of our regular range of vision that we don’t have to examine it. Instead, we keep moving forward, working harder and faster, which is why most of us are frustrated, exhausted and depleted. We all have a natural brilliance but we’re ignoring it. There are skills and tasks we excel at, and which come to us easily and naturally, with very little effort. Yet, we spend hundreds of thousands of dollars to learn a skill or occupation that ultimately inhibits our natural abilities and is not sustainable. Much of the time we simply are living to work and we spend most of our time working. Unfortunately this is running us ragged, depleting us, and we’re not doing what we love. The blind spot is that we do not notice, or correctly identify, the reason we are worn out, depleted and not finding the meaning and fulfillment we want. We are doing what we have been taught to do – pick a career (or business) other people are successful with and learn to do what they do. The truth is, it IS possible to become a specialist by doing what lights us up, charging a premium for that, and having a hell of a lot more fun. Just as we’ve looked to other people’s success stories in the past, we can also look to success stories of people who are “doing it their way”, who are using their natural and effortless gifts and talents to impact the world, build a sustainable business and, yes, have even more fun and more time with the people they care about. Second, we Sense Potential Everywhere and tend to hire based on our belief in people’s potential. While this is honorable in intention, and we like doing it because someone somewhere along the way gave us a shot based on our potential, the truth is it requires a tremendous amount of time to manage, train and develop the skills of someone who has “potential” but not “experience.” If you’ve hired someone for their potential and you’ve had to do a lot of their work for them or you didn’t train them to do the work well, you begin to think you can’t hire/find good people because of your past experience with hires not working out. So you continue to hire people who don’t have all the necessary skills for a role because you “believe in them”, and then lose time (i.e. money) because of all the guidance they need. The good news is we actually CAN find and hire the right people – when we focus on proof of competence (prior evidence that they can already have the skills necessary for the job and have performed well doing the job) and build a staff that can instantly create value and make an impact – if we learn how to interview and hire appropriately. Making this shift doesn’t have to take a lot of effort on our part, either. Just as we are natural at sensing someone’s potential, we are also brilliant business people who can create the right set of questions to pre-screen applicants and invest our time with the candidates most likely to add value to our companies immediately. The third, and perhaps most challenging blind spot is that we Avoid Structure. Innovators + Influencers view structure as limiting, constraining, and restricting our freedom. We love variety and flexibility. We went into business because we wanted more freedom, not a bunch of boxes we have to fit into or rules we have to follow. The truth is, though, there are certain business components that are required in order for our businesses to grow, but we either don’t think to do them, or we dislike doing them (so we don’t). The problem is that as long as we reject structure, our business suffers because we “keep everything in our heads.” This causes us stress because we have to expend unnecessary mental energy keeping track of everything (which, as Innovators + Influencers, we aren’t that great at), we lose track of important details and begin letting people down or failing to keep our word. And, this business behavior causes stress to our employees as well. Without structure, goals and expectations are unclear, uncertainty abounds, and our most valuable assets leave because they can’t work in the environment any longer. The good news is there’s a “sweet spot” of structure for us that allows us to work easily and allows our businesses to grow and thrive. This structure has to be designed specifically to work with our Personal Operating System, allowing us to do the things we do best, and identifying the proper roles (team members) and processes needed to support growth. In other words, we can structure our businesses to run well, rather than letting them run us. While some Innovators + Influencers have figured out how to do this on their own, they are few and far between, and luck has played a great role in their success. It is possible, but we have to remember the very nature of a blind spot is that we can’t see it. And if we can’t see it, we aren’t aware of it’s impact, and we can’t do anything to change it. Blind spots operate in the background impacting our decisions and our behaviors. It’s not until we pull aside the curtain – the right curtain – that we can see what’s really running the show. 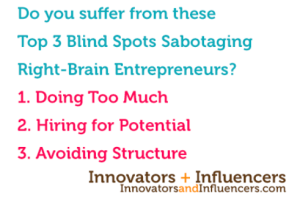 These are the most significant three blind spots common to Innovators + Influencers. Your first step toward taking your freedom back is to identify your Personal Operating System and the blind spots inherent in that system. Once you know these, you can begin a more accurate evaluation of your business and what needs to happen to reach that next level of growth.